Shoes blues | Jon Katz, P.C. Nikita providing further fodder for Mad Magazine. Shoe-throwing is a traditional insult in some parts of the world. Had reporter Muntadhar al-Zaidi not thrown his shoes at George Bush, II, on December 14, millions of people would still have been in the dark about such a tradition. 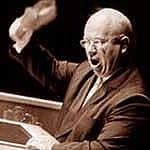 Had then-Soviet premier Nikita Khrushchev not banged his shoe on his desk (was he banging a spare shoe brought for such occasions?) in October 1960 at the United Nations during the Philippine delegate’s accusation that the Soviet Union was swallowing up Eastern Europe, perhaps the delegate’s compatriot Imelda Marcos would not later have been bitten by a shoe bug. As to my shoes, they are all vegan. The National Lawyers Guild — with which I have had a long love-cringe relationship, as detailed here, here and here — has stuck its shoe in its mouth by issuing a news release in which its Executive Director, who is very likable and apparently an effective peace broker, proclaims: “With that single brave act, Mr. al-Zaidi has inspired the Guild to transform one country’s negative symbol into a gesture of goodwill.” At least the news release encourages people to donate shoes to the needy. The video of the shoe-throwing incident shows Mr. al-Zaidi aiming at least one of his shoes at Mr. Bush. That is a violent act. As with so many Guild statements, the Guild’s failure to dissent from the shoe-throwing is not in my name. Violence is violence; violence begets violence; and violence must end now, starting with each of us. Certainly, journalists are in a unique position to get dissenting messages to otherwise communication-sheltered world leaders. However, they need not do so violently, as exemplified by Wenyi Wang’s April 2006 White House shout-out to the Chinese president with a modest but passionate insistence that human rights be protected in China. Jon Katz. ADDENDUM: Thanks to my Eastern European politics professor Sarah Meiklejohn Terry for telling the story of the shoe-banging Khrushchev, in 1983.